If You Can Define “Oligarchy”, Thank a Teacher! #EducatingGates Rally – Seattle – June 26th! America’s teachers are getting blamed for the effects of poverty by the Bill and Melinda Gates Foundation. Your children are being labeled as failures. Parents are being blamed. Public education as an institution is being blamed. Yet the real blame lies with the oligarchy. Bill and Melinda Gates want to operate public schools like they did Microsoft, stack ranking children, teachers, and schools with their corporate education reform experiments even though stack ranking failed at Microsoft. Yet the oligarchy is setting public education policy and has been for many years now. The oligarchy accepts no accountability for their mistaken experiments with children and teachers in public education. Leading the oligarchy are the richest couple in the world – Bill and Melinda Gates. Leading corporate education reform policies through their wealth and power granted to them is the Bill and Melinda Gates Foundation. The weight of the oligarchy rests on the back of innocent school children, public professional servants aka teachers, and the public good – our public schools. We are here to take back that power. In order to take back that power, we are here to educate and activate the public about the hoax of corporate education reform and to build a strong, powerful #StopGatesCoalition. Educate and activate the public about our vision of public education. Educate and activate the public about the damaging influence of corporate education reform as promoted and funded by the Bill and Melinda Gates Foundation. Expose the hoax of corporate education reform, privatization, Common Core, high stakes tests, and “school choice”. Identify the real problem and the real solutions. Build a coalition of groups and organizations who want to work with us to become free from the policies imposed by the investments of the Bill and Melinda Gates Foundation. WaBATs made a great connection with Bill Moyer of the Backbone Campaign. Some of us will be joining their crew for their Localize This Camp on Vashon for training on artful resistance in August, but will also engage with them prior to the rally for great ideas that are going to make our rally stand out in a crowd. Activists, join other local Backbone Campaign “Localize This” Artful Resistance training in your area! Follow them @BackboneProg on Twitter. Anthony spent 24 years working in Oakland schools, 18 of them as a science teacher at a high-needs middle school. A National Board-certified teacher, he now leads workshops with teachers on Project Based Learning. He is the co-founder of the Network for Public Education. With education at a crossroads, he invites you to join him in a dialogue on education reform and teaching for change and deep learning. Anthony created a dialogue with the Bill and Melinda Gates Foundation 2 years ago. He recently wrote this blog “What Will It Take to Educate the Gates Foundation?“ as an update of how corporate education reform experiments have worsened the public school experience for children, teachers, communities, and democracy. Follow @AnthonyCody on Twitter. Morna McDermott has been working in, with, and around public schools for over twenty years. Currently she is an Associate Professor at Towson University, in Maryland where she teaches various theory and methods courses in the College of Education. Her scholarship and research interests focus on democracy, social justice, and arts-informed inquiry in K-post secondary educational settings, and working with beginning and experienced educators. She explores how the arts serve as a form of literacy that challenges traditional classroom learning and dominant narratives. Recent art work and installations have emphasized the value of art as a “public pedagogy” in creating grass roots social-political-educational change. Dr. McDermott currently serves as the Arts Based Educational Research section editor for the Journal of Curriculum and Pedagogy. In addition to publishing in educational journals and books, she writes ongoing columns for www.examiner.com. Our rally has been endorsed by the national Badass Teachers Association, the Network for Public Education, C.O.R.E. Teachers’ Union caucus in Chicago, and more endorsements which will will post as they are coming in daily. If you wish to endorse us, please contact us in the comment section on this page. We joined with the “Gates Foundation Truth Squad”outside the Gates Foundation Visitor Center to engage with young people attending their “Teen Action Fair”. This was our first action in coalition building. Here is their flyer and some facts about the Bill and Melinda Gates Foundation. Here is a link to their blog. We joined the world’s March Against Monsanto on May 24, 2014, marching in Seattle to the Bill and Melinda Gates Foundation protesting their investment of $500 million in Monsanto shares. This was our second act of coalition building. We joined the rally and march, passed out our flyers, and spoke at the Gates Foundation. We also made connections with the Seattle Global Justice / Community Alliance for Global Justice while at the March Against Monsanto. Follow the link to become a member. Join us! We plan to share the microphone with individuals and groups at the rally. Here is the flyer we will be passing out before and during the rally. See front of flyer above. While Teachers’ Letters to Bill Gates is limited to the voices of professional teachers, this blog is designed to allow the public to share their concerns about the impacts of the policies created by the investments and agendas influencing policies by the Bill and Melinda Gates Foundation. We invite you to share your concerns here in our comment section. We will post letters to the Bill and Melinda Gates Foundation here. Join us here to express your concerns about the hoax of corporate education reform. How do the policies of the Gates Foundation impact your children? You as a student? Your school? Your profession? Your community? Democracy? Are you interested in building a coalition with us? What issues are you concerned about regarding the Gates Foundation and how do they impact you? Our story is under construction as we form relationships with other groups who have realized the negative consequences of the Bill and Melinda Gates Foundation policies and are working for democracy vs oligarchy. 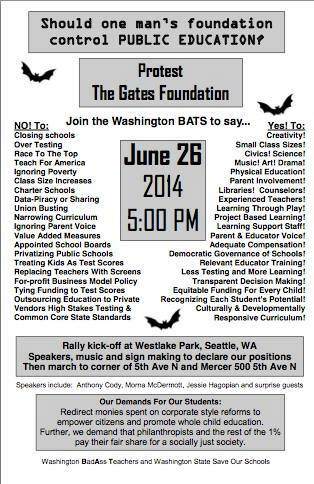 Join us in our the #EducatingGates Rally on June 26th in Seattle and in building our #StopGatesCoalition Movement! Follow us on Twitter: @EducatingGatesF . Sign up for our rally here. Interested in being part of our Flash Mob at the Rally? Join the Facebook Flash Mob event here. Meanwhile, if you can define oligarchy, thank a teacher! We all do better when we all do better!